If you've been reading other posts, you've probably picked up on the fact that I am the world's laziest knitter. Being lazy and curious has it's advantages, in that I am constantly looking for new ways to save time, energy, and brain power. I've been fascinated by the methods of provisional cast-ons that I've read about, as well as the intense discussions of the stretchiest cast-on. Most of the former revolve around crochet hooks, extra threads, unpicking same, carefully scroonching stitches onto needles, and so on. And the latter, well, suffice it to say that I know perfectly well how to do all the exotic methods, but why bother? Of course I have another option for you that encompasses both provisional and stretchy. And it couldn't be easier. 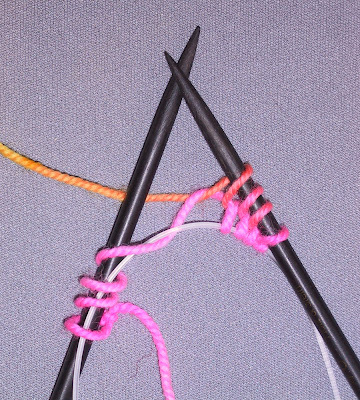 Take your knitting needle (any kind) and a circular needle with a nice cable. Make a slip knot and put them together thusly. 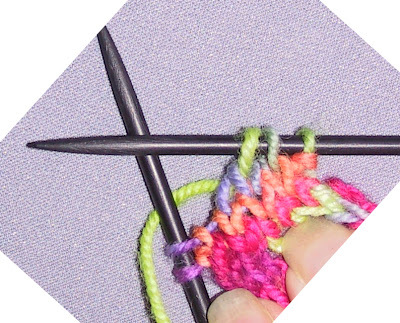 Wrap the yarn around both the needle and the cable for the number of stitches you need, plus some extra wraps. I can't give you an exact number here, but for 20 stitches, I wrap an extra 5 times, for 100 I wrap an extra 20. The wraps get sort of messy at the end, so I just make some extra. As this cast-on takes less than a minute for 100 wraps, it really doesn't matter, because you will drop the excess at the end. Turn the needle over so the thread is coming from right to left. Start knitting. 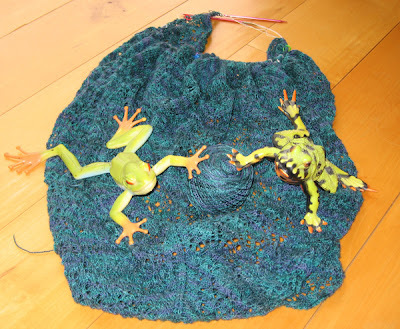 Keep knitting until you have the correct number of stitches. Unwind the excess. Drop the slip knot if you want. Whatever. Now, at this point, your provisional stitches are on the cable of the circular needle. I happen to like to use KnitPicks cables and screw on their needle cap thingies. But you can leave your stitches on the circular needle--make sure you do put some sort of cap on the end so the stitches don't fall off. Turn the work around as usual and continue knitting away. Here is the second row half-done. That's it. 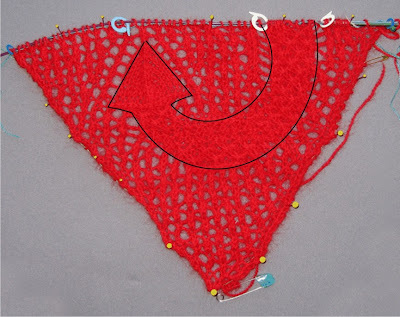 When you are ready to do whatever with your provisional stitches, you can: Turn the work upside down and knit the other end if you are starting from the center, attach your lace edging, or do some grafting. Now I hear shrieks of WHAT ABOUT THIS STRETCHY CAST-ON YOU PROMISED?? Oh. Well. Turn the work upside down and do Elizabeth Zimmerman's Sewn Cast-Off on the stitches currently resting on the cable. Great for socks. Great for lace. If you use the sewn cast-off method to end your piece, well, both sides now match, don't they? 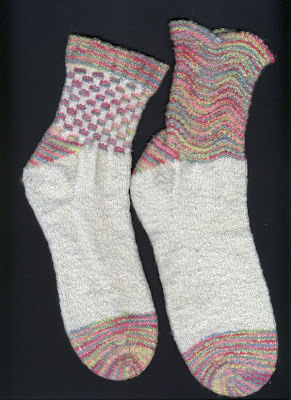 Elizabeth Zimmermann's Sewn Cast off from Knitting Without Tears. 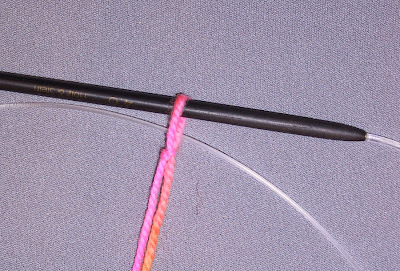 Break yarn, leaving a tail about 4 times as long as the circumference of the edge. 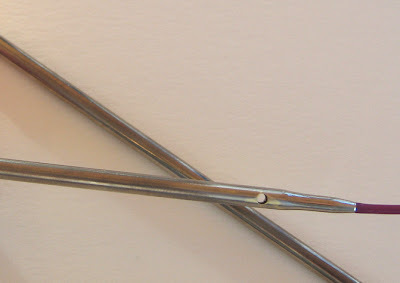 Thread a tapestry needle. Repeat from * until you run out of stitches. Work in tail on the inside of the knitting and trim any excess. I am SUCH a lazy knitter. I HATE picking up stitches and won't do it unless there is absolutely no other option. And of course there's another option! Need you even ask? I guess I invented the concept of vertical lifelines, as I have never heard of them anywhere else. Basically, it's just a thread that runs up the side of the knitting along the edge. Every time you begin a row, just pick up the yarn under the lifeline so the working yarn wraps around it. And when you need those edge stitches, you can slide a needle through all the pick-ups in a few minutes. You will probably have to pick up some extra stitches, as this method only threads through every other row. However, most of the work is already done and it's easy enough to evenly add the extra stitches where you need them. For long, long edges such as shawls, I use a twisted silk embroidery thread or buttonhole thread wrapped around a cardboard bobbin. As I need more thread, I just unwrap it from the bobbin, which is pinned to the shawl or left floating, depending on my mood. 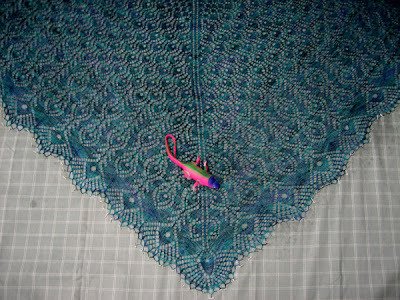 I am at Row 61 and thought you might want to see how beautifully the designer uses stitch textures to create the dragon. This picture shows the bottom of the tail, complete with the pointy tip. I am awestruck by her creativity. Click on the picture for a larger view. As you might know from previous posts, I adore Boye needles for lace, but loathe the cables. And, while I love KnickPicks tips for most other knitting, they are just too slippery for lace. But the cables, ah, they are masterpieces of flexibility. So, I thought, how difficult could it be to make Boye tips fit KnitPicks cables? As it turns out, it's not too difficult. That hard part was figuring out who could do it. Jewelers refused--their tools are made for softer metals and they don't do much milling or screw thread tapping. Then I started to think about who fits odd things into other odd things. Hmm. DH bought a fancy laser gun sight a number of years ago and had it retrofitted to one of his handguns. Gunsmith. Bingo. So I called one in a nearby town and paid a visit with my little sets of interchangeable knitting needles. He absolutely didn't even flinch at my requests. At least so I could see. He's probably laughing himself sick as I write this, but who cares? He got the job done. Here's a KnitPicks cable attached to two sizes of Boye tips. Ha Ha! Gunsmiths have little, tiny precision drill thingies and they spend a lot of time making part A fit Part B. It took him little more than an hour to retap all the Boye tips and fix the edges (the Boyes have a little indentation at the end). They fit perfectly. 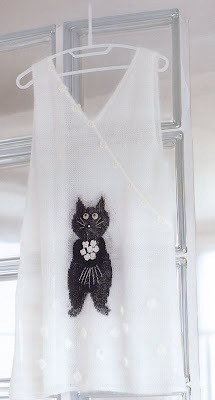 They knit lace perfectly. They are just PERFECT. Here's a closeup of the join. You too can do this. Just call Neal Spruill at 770-503-7572. He will arrange for you to send him your tips. He is charging about $3.75 per tip. My advice is to not have the size 2 needles re-tapped. The walls are so thin that the the milling shows a bit on the outside. And the #2s are as slick as KnitPicks anyway. And probably you shouldn't bother with the sizes greater than #11--do you really knit lace on those? I had one other job for Neal, and he did a perfect job on this too. See this needle? 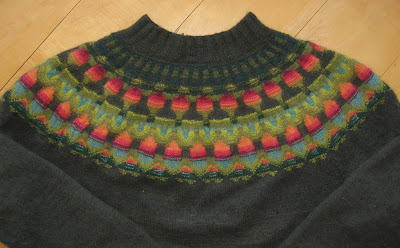 It's a KnitPicks #3. Not an Options needle, so there's no hole for a lifeline. I had him drill a hole in the needle. It's perfectly smooth. 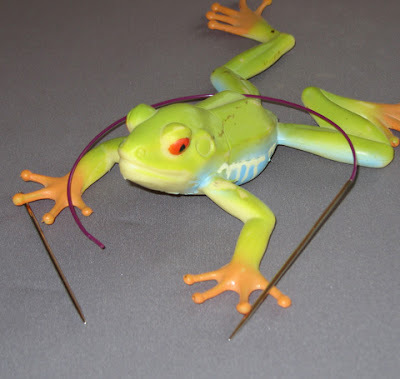 I am going to take him all my other fixed-cable needles and have the holes drilled. When you need a lifeline, the hole saves a LOT of time. Notice, by the way, that the KnitPicks shiny nickel finish is turning black. The surface is pitting a bit, too. Not a good portent for longeivity. On a less cheery note, here is the latest on my WIPs. First we have DH's Cheshire Cat alpaca/silk sweater in progress. After finishing two cuffs, we decided they were too tight. Ribbit. I had gotten about halfway up the legs, but decided I hated the way the ribbing pattern looked and felt. Ribbit. And here's the ratty headscarf (Peacock shawl). I have exactly two rows of this sucker left before I finish. If you see an excessive number of lifelines, it's because half the stitches seem to be leaping to their death when I am not looking. For the rest of the shawl, a lifeline every ten rows or so was just fine. I lifelined every one of the last ten rows after ripping back four times. 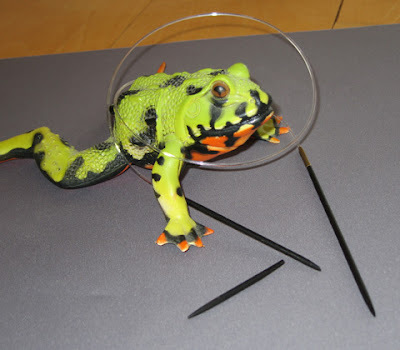 Ribbet. 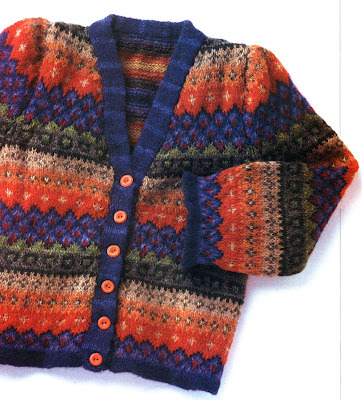 Swedish Bohus sweaters, famous for their magnificent color work, were the brainchild of Emma Jacobsson. 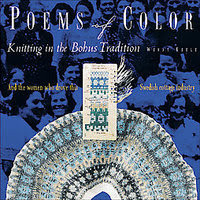 Like so much fine handwork, Bohus knitting was developed as a means of providing income to housebound women. Started during the Depression, Bohus Stickning at first produced plain garments such as socks and mittens. These articles couldn't be sold at a premium price, so Emma began designing more sophisticated items with complex color patterns. Wendy gives terrific directions for a dozen or so sweaters, hats, and mittens. 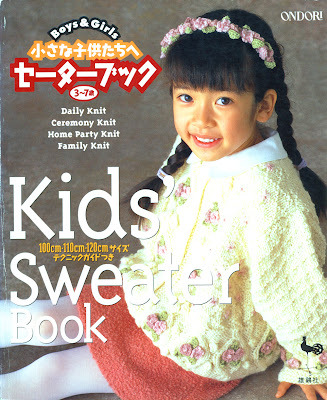 She also sells kits for most of the designs in the book. You can order them here. Both sweaters are size 48, and once the fun of the yoke is finished (these sweaters are knitted from the neck down), I spent what seemed like several lifetimes knitting the rest of the sweater. For some reason, the dark green wasn't too bad, but ach! The black body was interminable! 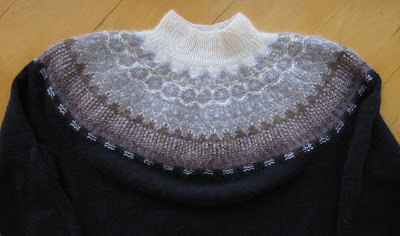 The result is exquisite--I think it's the most beautiful piece of knitting I ever produced. But at the time, I was really, really tired of black black black. I also ordered the Large Collar for me in pink (called the Pink Collar) from anita.k.nilsson@vgregion.se. 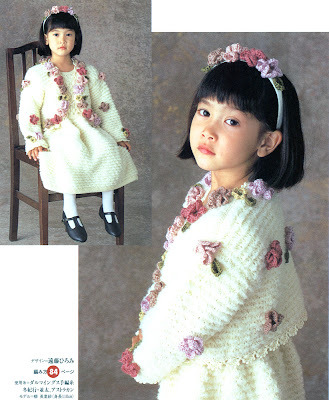 The yarns in her kits are slightly finer than Wendy's--8 stitches per inch instead of 7. The yarn is also softer. You can see the pictures of these beauties here. I am seriously tempted by Forest Darkness, but I have enough projects in the queue. Someday. 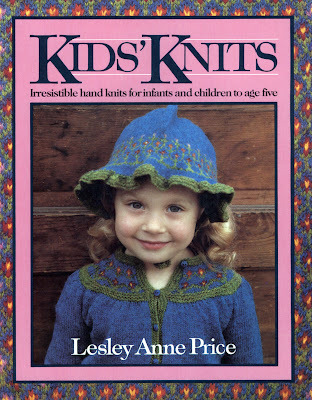 Here's one of the most charming knitting books I have ever had the pleasure to, um, look at the pictures of. 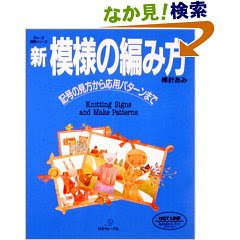 It's in Japanese, but experienced knitters shouldn't have a problem working the patterns from the charts. 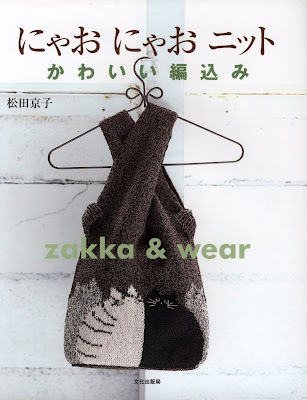 The book is called Zakka & Wear. "Zakka" roughly means knickknacks--things with no conceivable use that you display in your house but have to dust periodically. 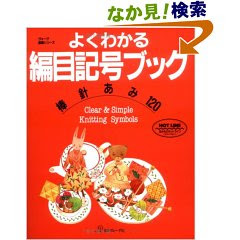 There are a few zakka projects inside (pillows), but the Wear part of the book was what forced me to hand over my yen to the bookstore. 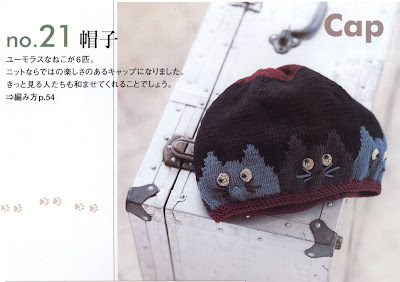 The pictures are totally clear and make me want to drop my current WIPs and immediately start knitting...cats. 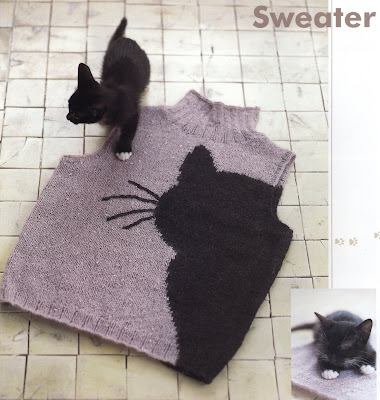 I know I promised no cat pictures, but really, these cat pictures are eminently knittable, so they don't count. It's my blog and I say so. Cat haters should avoid this book like the plague, but the rest of you will enjoy every single page. Today's mail brought two fat packages. 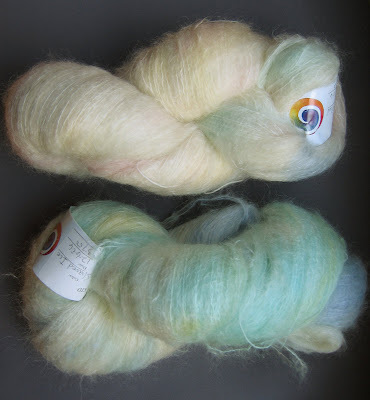 The color genius of Lisa Souza resulted in these two lucious, soft, squishy, silky skeins of mohair lace. The top skein is Mother of Pearl colorway and the bottom is Shaved Ice. The top one is earmarked for the capelet in Victorian Lace Today. Shaved Ice for the Luna Moth shawl. 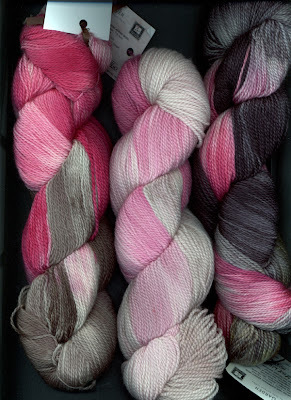 And the color genius behind Katsara yarns brought these lucious, soft, squishy, silky skeins of sock yarn. Top to bottom: Hosta, Cantana, and Pansy. The stash waxes fat and happy. 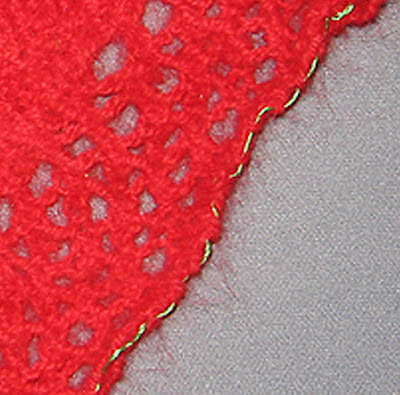 The Peacock shawl's pattern requires moving markers. A lot. For the first four charts, I laboriously removed the marker and replaced it where it needed to go. In the middle of chart 5, I realized that I could just push or pull the stitches back and forth over the marker. This probably wouldn't be worth it if the marker has to move over multiple stitches, but it works just great for single stitches. A singular Duh moment I've never seen mentioned anywhere. Decreases that require slipping and/or flipping stitches make me um, hiss, in frustration. I like to use slick needles, but too many times, when I pass a stitch over, the entire unit flips off the needle, runs down the complicated lace pattern, and dares me to breathe. Traditional method: slip 1, k1 pass the slipped stitch over the knit stitch. Better method: Slip 1 knitwise, Slip 1 purlwise, knit the two together through the back loop on the right-hand needle. 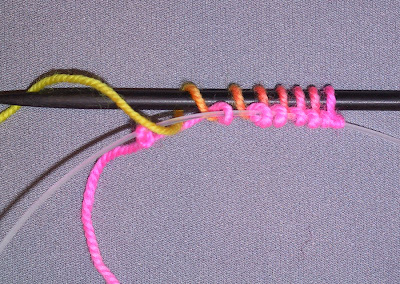 Slipless method: Put the needle through the front of the first loop and the back of the second and knit them together as a unit through the back loop. And pull it through both stitches. Traditional method: There are lots of variants of this--all of them ghastly. Here's one: Slip 2 knitwise one at a time, knit 1, shlep the 2 knit stitches over the slipped stitch. There's a K3 together through the back loop that twists the stitches, another that involves a K1 Slip-Slip-Knit and pass something over something else. Slipless method: Put the needle through front of the first stitch and the back of the next two stitches. Knit the together as a unit through the back loops. And pull it through all three stitches. 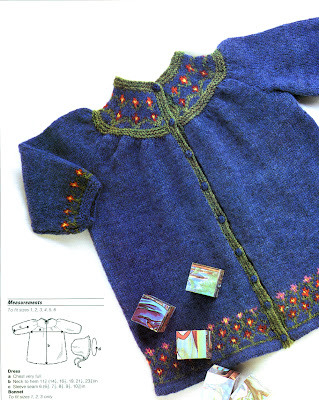 Traditional method: Slip 2 knitwise as a unit, knit 1, pass the slipped stitches as a unit over the knit stitch. Slipless method: Put the needle through the front of the first two stitches, reach around and put the needle through the back of the third stitch and knit them together as a unit through the back loops. It's kind of squinchy, but with practice (and loose knitting), it becomes effortless. Wrap yarn... (I notice here that I am wrapped the yarn wrong for the photo. It should go over the needle. 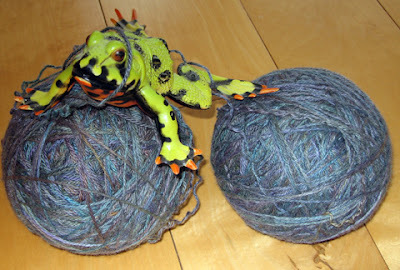 Please excuse me...taking another photo, cropping, uploading to Blogger....just wrap the yarn the other way, OK? 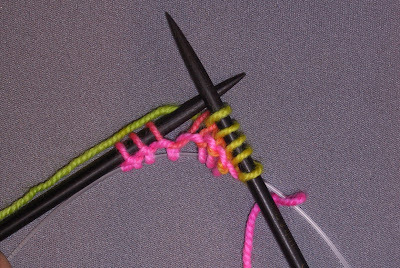 Note that you should practice the easiest one first (K2 together--left slant) to get an idea of how these stitches feel when they are being knitted. Work in good light so you can see what you are doing. When you feel comfortable with this one, progress to the K3 together--left slant. When you are totally comfortable with the first two, graduate to the K3 together--central decrease (no slant). 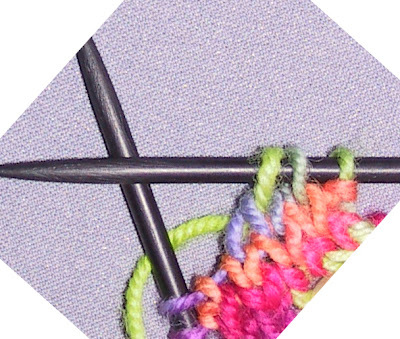 If you are having trouble getting the needle through these stitches, pinch the knitting below them and pull down. The stitches will open up nicely. 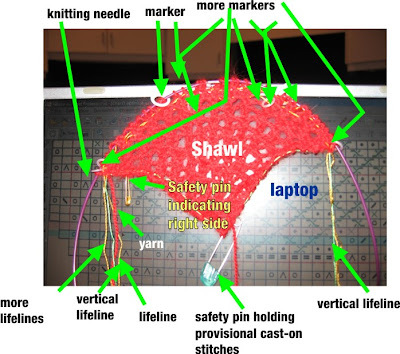 You will be amazed at how these techniques will improve your knitting efficiency, especially if you are doing lace. You'll attain a nice rhythm, too, because you don't have to stop and slip. 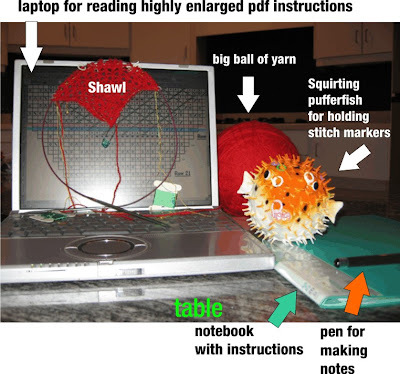 I don't think you can do these tricks if you are a tight knitter. 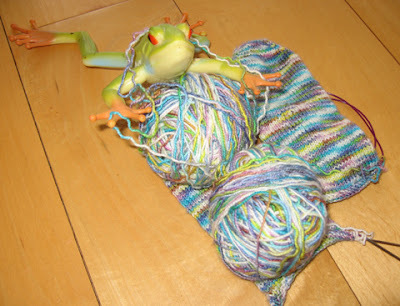 Why are you a tight knitter, anyway? Loosen up! Relax!